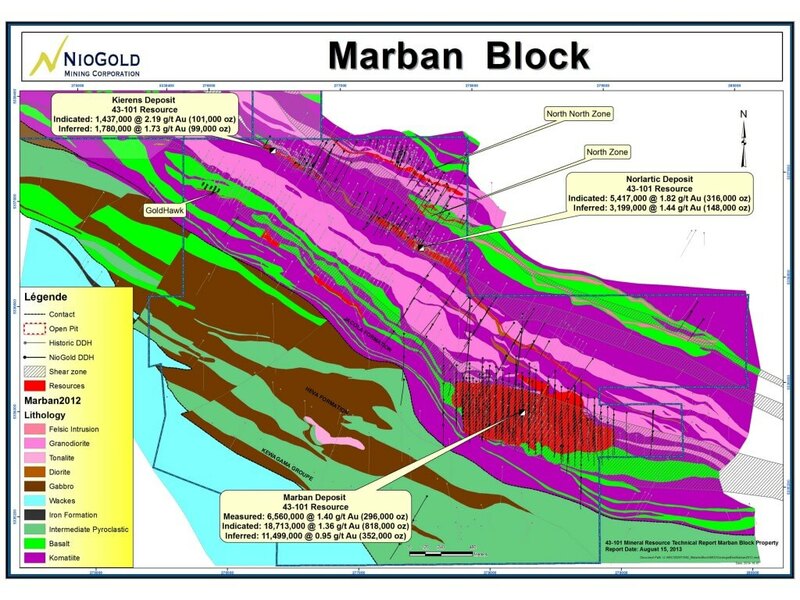 The Marban Block property is located about 15 kilometres west of the town of Val-d’Or in the Abitibi region of Québec, Canada. The property consists of 42 claims and 3 mining concessions for a total surface area of 9.8 square kilometers. Six active or past producing mines lie within a 10 kilometre radius of the property: Canadian Malartic, Goldex, Kiena, Camflo, Midway and Malartic Hygrade. Outside the deposit, the strike length of the Norlartic system is 1,200 metres and converge toward the hanging wall of the Marban deposit. This mineral resource estimate was calculated using the Canadian Institute of Mining, Metallurgy and Petroleum (“CIM”) Definitions Standards for mineral resources in accordance with National Instrument 43-101 – Standards of Disclosure for Mineral Projects. Mineral resources are not mineral reserves and do not have demonstrated economic viability. (1) The listed grades for historical production are uncertain because some production records combine two or more deposits and it is not clear whether the reported grades represent recovered or in situ grades. In some cases, it is also unclear whether the reported numbers include waste from development workings. Numbers may therefore show some discrepancy depending on the source. 1: Rounded to nearest one thousand (1000), which may cause apparent discrepancies. 4: Estimate uses a cut-off of 0.5 g/t Au on resources from surface to 200 metres vertically and 2.5 g/t Au below 200 metres. Approximately 135,000 metres of diamond drilling have been completed since 2006. There are three known satellite zones to the deposits: Gold Hawk, North and North-North. Several new showings were intersected in diamond drill holes throughout the property.